USB 2.0 interface means extremely easy installation and setup. The Axon Digidata® System is the most widely used for a variety of electrophysiology recordings in laboratories worldwide. This Digidata 1550 Digitizer further extends the precision and quality of the existing Axon Digitizer platform with enhanced performance in command voltage output control and sampling rate. It enables to record up to 8 cells simultaneously to study the function of neuronal networks in your neuroscience research. It also achieves a high-resolution data acquisition by capturing more data point in less time in your ion channel research. 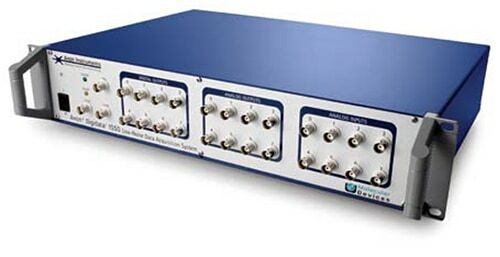 8 analog input channels to digitize acquired signals up to 500 kHz independently. 8 analog output channels to send command voltage output independently. 8 digital out channels to control the periphery equipment used in sophisticated experiments. Independent analog-to-digital converters for each input channel ensure low crosstalk levels and high data acquisition rates. USB 2.0 connection allows operation on virtually any current PC computer running Microsoft Windows 7 (32-bit or 64-bit) Operating System, including laptops. 16-bit resolution for state-of-the-art signal-to-noise ratio. All signal connectors on the front panel for ease of access and maintenance of the electrophysiology setup. Rack-mount case for tidy installation of all components in the electrophysiology set-up. User guide written by scientific consultants, with the assistance of Axon Instruments staff, for straightforward start-up and as an in-depth reference. The Axon Digidata® 1550 Digitizer is a low-noise high-resolution 16-bit data acquisition system for electrophysiology recordings. It is self-contained and communicates with the host computer via a USB 2.0 interface for extremely easy installation and setup. Designed for fast results, the Digidata 1550 Digitizer comes with AxoScope software for Microsoft Windows OS and is ready to acquire data immediately after installation. Absolutely no programming is necessary. The Digidata 1550 Digitizer features a maximum sampling rate of 500 kHz per channel, with an outstanding total data throughput rate of 4 mega-samples per second. This enables you to capture even the fastest signals in the biorelevant frequency range. Both the inherent digitizer noise and channel crosstalk noise are rated at less than ±1 mV average p-p at 10 kHz, within a ±10 V input range, making the Digidata 1550 System one of the quietest digitizers on the market. For intuitive set-up, the front panel is clearly laid out with eight analog input channels and eight analog output channels, eight general digital outputs, one dedicated digital output to trigger devices such as oscilloscopes, as well as trigger inputs to start acquisition and to tag data. The back panel has four additional analog instrument telegraph inputs, as well as a DB-25 connector for the digital outputs. With its USB 2.0 interface, you can easily connect the Digidata 1550 Digitizer to a laptop computer without the need for a with peripheral PC card. Designed to support continuous data acquisition within a multitasking operating system, the Digidata 1550 Digitizer is fully compatible with the included AxoScope 10.4 Software for Microsoft Windows 7 (32-bit or 64-bit) and the optional pCLAMP Software for Windows. Ion channels are pore proteins that are involved in a large variety of physiological processes. Basic research in the ion channel field furthers the understanding of ion channel function as well as their roles within cellular pathways and processes. Single-channel research helps with elucidating the mechanisms underlying ion channel function on a single-molecule level. Whole-cell and perforated patch clamp recordings are typically used to investigate the action of modulators on entire populations of ion channels in the membrane of a cell. Learn more. Ion channels are involved in many cell pathways and understanding the function of ion channels in response to changes in membrane potential or the presence or absence of other molecules is important in order to understand exactly how ion channels participate in normal and abnormal biological processes such as cell differentiation and migration, disease states, neuronal communications, etc. Ion channels play a role in many diseases, including hypertension, cardiac arrhythmias, gastrointestinal, immune and neuromuscular disorders, pathological pain and cancer. By understanding the exact role that ion channels play in a particular disease, researchers might be able to find a way to affect the ion channel in such a way as to alter the course of the disease. A critical part of drug discovery involves safety assessments, such as hERG testing, in order to eliminate any compounds with potential safety concerns. Conventional patch clamp has played an important role in collecting evidence for the absence of side effects before submission of a drug candidate to regulatory authorities. Even if automated electrophysiology has shifted safety testing to earlier stages in the drug discovery process, follow-up with conventional patch clamp is an essential step in the workflow.